You are here: Home / News / Applications Engineering Ltd supply Sika VK3 flow switches for high-rise retrofit sprinkler project. Applications Engineering Ltd supply Sika VK3 flow switches for high-rise retrofit sprinkler project. Applications Engineering Ltd supply Sika VK3 flow switches for use in ground breaking project installing automatic fire sprinklers in existing Sheffield Tower Block. In a recently published report to the Secretary of State For Communities & Local Government the Chief Fire & Rescue Adviser, commenting on issues arising from the 2009 Lakanal House fire (2009)said: “it is not considered practical or economically viable to make a requirement for the retrospective fitting of fire suppression systems to all current high-rise residential buildings”. On August 30th an innovative national pilot project, managed by the UK’s sprinkler trade association, BAFSA began to address this report head on. The current building regulations only require sprinklers to be fitted to new high rise blocks that are over 30 metres in height (18m in Scotland). Following the Lakanal House fire in which six residents died, questions were asked about the benefits of automatic fire sprinklers to protect residents in such properties. In particular, Lakanal House and similar blocks only have a single stair case – something that has been illegal for many years. It is the view of many fire experts that providing sprinklers in such properties will compensate for this and other deficiencies. Even though all existing housing stock in Sheffield complies with current fire regulations, Sheffield City Council and Sheffield Homes recognises the benefits of automatic fire suppression in high rise buildings. 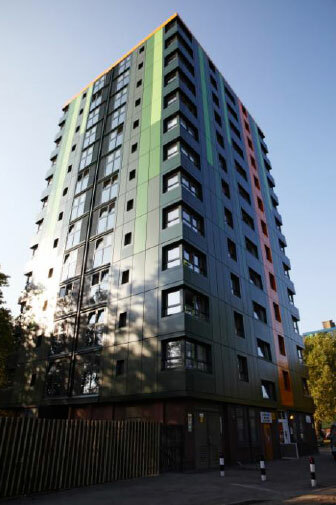 Over the following 6 weeks, a 38 year old high- rise social housing block in Sheffield was fitted with an automatic fire sprinkler system to test the ease and cost of such a retrofit. The 13-storey Callow Mount block of flats, in Gleadless, has been fitted with a sprinkler which will activate automatically in the event of a fire – containing and extinguishing any fire which starts and preventing the spread of flames. The system will give the 47 mainly elderly residents precious extra minutes to escape or be rescued by firefighters. This has been a ground-breaking exercise – the first of its kind in the UK. There will be little disruption to residents who will be able to remain in their flats throughout the project work. The likely cost of the project is around £80,000 which is being fully funded by BAFSA and its members.